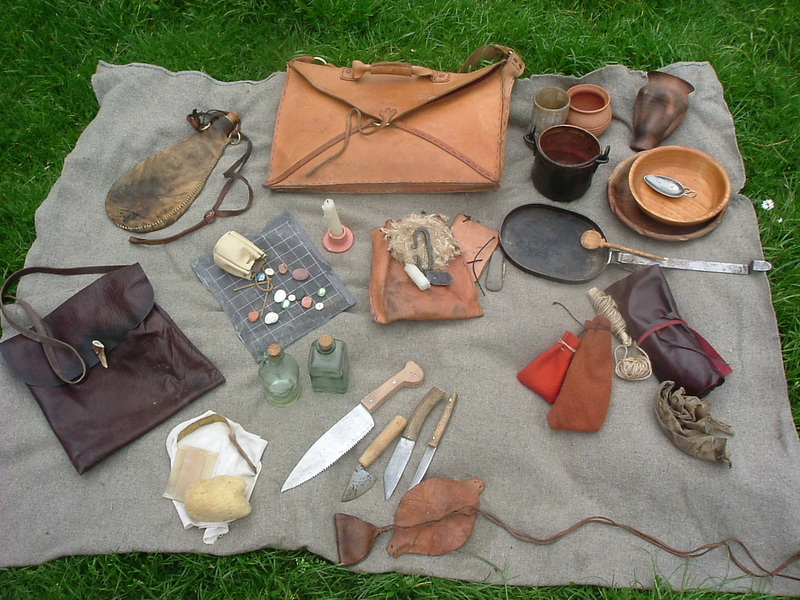 This is my marching kit, and it comprises all the equipment that a Roman legionnary will need on the march. Basically it's a camping bag. This kit doubles for the 3rd and 4th centuries, the basics of life in the field changed little, and neither did the tools. In the 3rd century the soldier may have slung his loculus (leather kit satchel) on a 'T' shaped pole (furca), just as his predecessors did back on Trajan's Column. Its pretty certain that such a practice was unknown by the time of the Constantine and Honorious. But the satchel serves as an excellent kit bag. It is flat(ish) and lies flat against the body when slung over the shoulder, it is made of thick leather so is fairly waterproof, and even has a handle for easy carriage. I did a 3,000 foot mountain climb with my loculus, walking over rough terrain and climbing rock slopes for 8 hours, and it was comfortable and held together fine! Wrapped in linen, these include dry lentils and dry barley, and would also be supplemented with bacon, smoked cheese, goat's cheese, fresh fruit, boiled eggs, dried fruits, and round wheat bread. You can just see hard tack in the photo, tough biscuits that last for years without going mouldy. In front of the loculus is a comb made from cow horn, and near it a sponge and a whetstone on a black cord, for sharpening blades. The sponge and comb sit on a finely woven linen wash cloth. A single knife sits on the blanket, but I have two. The larger knife is a German design called a saex and is popular with Roman troops in this period and in this part of the Empire. I made it from a bar of steel and a piece of deer antler. Next is a brown goatskin wrap which contains my leather working and sewing it, including awls, needles, linen thread, pliers and beeswax. An antler-hafted awl sits on top of the tool wrap. Behind the tool wrap are two brown wool cloths for general purpose use. Next you can see a wooden bowl, a wooden plate and a drinking cup. I have a cow horn drinking cup, but prefer to use this clay drinking cup made by one of my sons in a pottery class. It fits the bill perfectly. Honey wine tastes gorgeous when drink from it! I'm sure a soldier could get by with just the bowl (made by wood-turner, Paul Atkin). This wonderful creation was made by Steve Wagstaff and is an accurate copy of an original. Probably a civillian item it was designed to fit inside a portable oven. Soldiers have a good use for the iron folding frying pan! The bronze pateras (mess tins) of earlier centuries are no longer found in military contexts. We use civilian cooking gear in the 4thC. 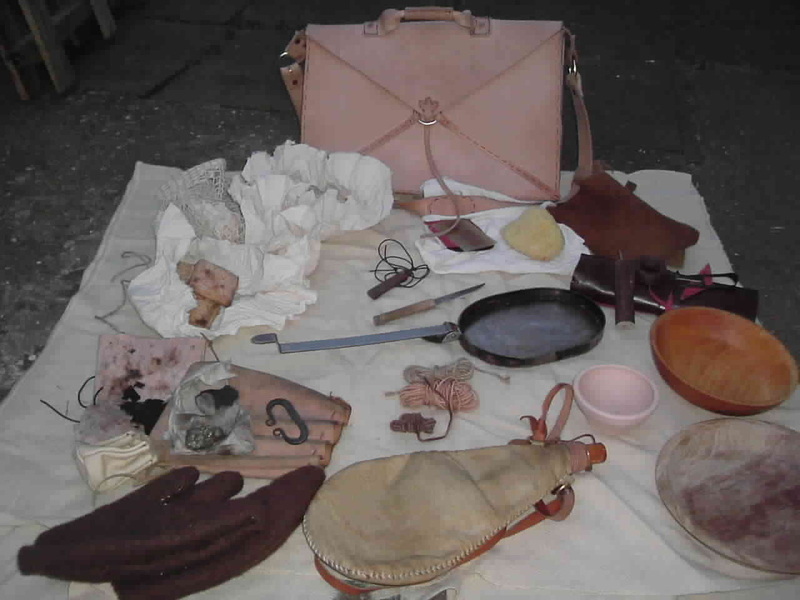 Below the pan are several bundles of leather thong and string which Fortunatus can use to repair something in a hurry while on the march, or for use in camp. Then there is the waterskin, a fantastic artefact produced by Saddler's Den. It works, I took it up Scafell Pike with me and it didn't leak at all. But, it did leak when it came through the post. Despite several e-mails I resorted to fitting my own liner which is certainly better than the one supplied. It is plastic, yes, not pigskin. See the article on Saddler's Den for more information on the liner. Brown woollen mittens to keep my hands warm on the march. In the large leather pouch I keep my firemaking kit, with which I have had mixed results so far. You might be able to see an iron firestarter and several pieces of flint along with some iron pyrites. You may also see a very small pouch in which I keep my tinder, I use finely chopped jute string, I should really be using hemp string. I also have a flat leather wallet that contains my 'charcloth', previously burnt linen that is black like charcoal and which glows brightly when struck with a spark. I need a lot more practice with this kit to become proficient with it, though I have produced fire with it. Below: A couple of years later and extra items get added to the kit, but some of these (such as the game board) wouldn't be carried on the march.